I can hardly believe it was 20 years ago today I was boarding a train in small town Truro, Nova Scotia to come to the big city of Toronto. I was 19 years old, and had never been out of the Maritimes before. Toronto was pretty overwhelming at first, but with the support of my older brother Jeff, who lived here at the time, better job opportunities and a much bigger metal music scene, I decided to stay. Found this video on you tube last night, and it has so many pictures of places I've seen down home, I wanted to share it. Take a look at the beautiful province I'll always call home. It's been 22 years for me. Wow! 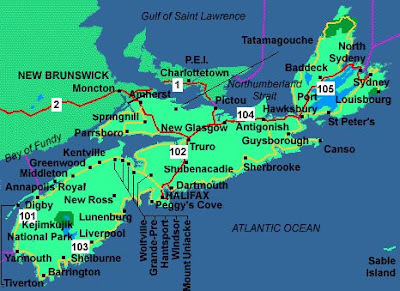 I haven't moved as far as you have, but the Maritimes are still very close to my heart. Whenever we cross the NB-NS border, I always say "NS! Welcome home!" I've yet to do that coming back the other way. Everything about NS I love! The people, the scenery, the pace. Usually when I get home to the South Shore, the lighthouse blaring, as if to say, "You made it! Welcome back! Enjoy your stay and come visit me for a while." I usually leave home refreshed and ready to tackle another day. It's a little easier to leave to come back to NB now than it was at first. NS is home. Always has been and always will be. You can take the girl out of the province, but you can't take the province out of the girl.